It is that time again, friends! 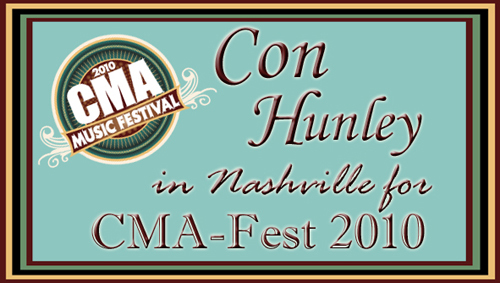 Con and the IMMI team are in Nashville for another fun-filled week attending CMA-Fest 2010! 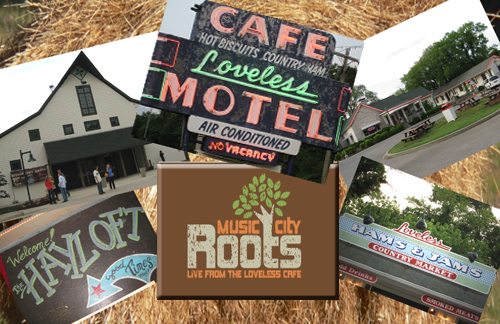 Our first stop this year is a performance at the Loveless Barn as part of the Music City Roots Show! Con was proud to be invited to be part of this show during Fan Fair week! You have to put the Loveless Cafe on your list of places to go! The area is just as lovely as you can imagine, and the food is wonderful! They have recently added a "barn" to the quaint shops and structures surrounding the cafe. The Loveless Barn is a great venue for private parties and receptions. 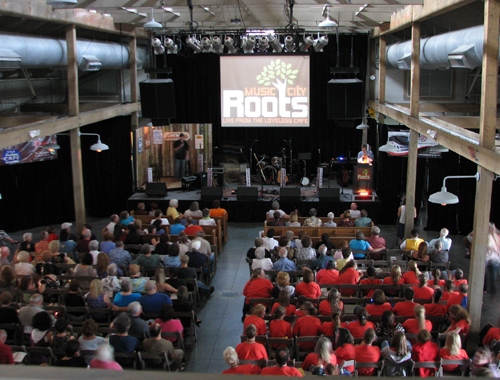 It is also home to the Music City Roots Show every Wednesday night. The show has grown to be an area favorite and is broadcast live on the legendary WSM Radio Station. The Music City Roots show is formatted much like the old-time live radio shows like the Louisiana Hayride and Grand Ole Opry. There is a small nook at the left side of the stage set up with seating and mics so that the host can conduct interviews with the artists. While the interviews are going on, the stage hands and techs get the next band ready for their portion of the show. The right side of the stage has a podium and is reserved for the emcee of the show. The show's skilled team carries out all the transitions seamlessly! At left, author and journalist Craig Havighurst interviews Con before his portion of the show. Here is a shot of the stage from "The Hayloft" just before the show gets underway. 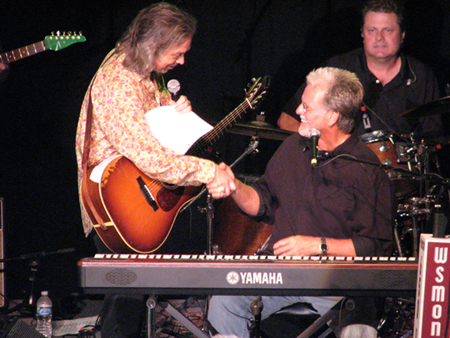 Hosts for the evening were Jim Lauderdale, left, and Bill Cody, right. They do a great job entertaining the crowd and keep things rolling! Jim Lauderdale brings Con on and we're ready for a great set! The band agreed it was great to kick off our 2010 CMA-Fest experience at the Loveless. The usual suspects were on hand for the evening's performance: Herby Wallace on steel; Greg English on guitar; Burton Akers on bass; Ken Jackson on sax; and Stan Williamson on keys. Of course Con's brother Kenny and sister Ruthie were glad to be there blending their beautiful voices in harmony! Lejoe Young was filling in on drums, and he did an awesome job! And Con was happy to have Kirk "Jellyroll" Johnson sit in on harmonica. 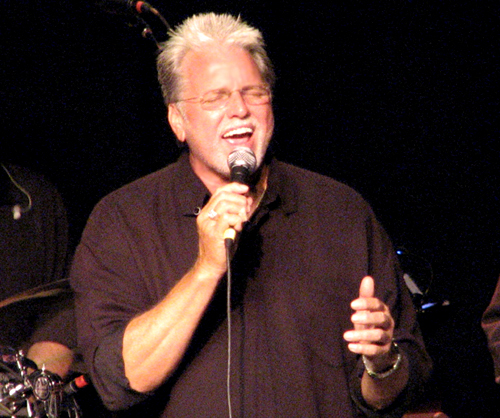 Jellyroll was one of Con's original bandmembers and played for Con for many years on the road. It was great to have him with us at the Loveless! At the end of Con's set, Lauderdale steps out to give Con a big "Thank you!" for being part of the Music City Roots show during Fan Fair! 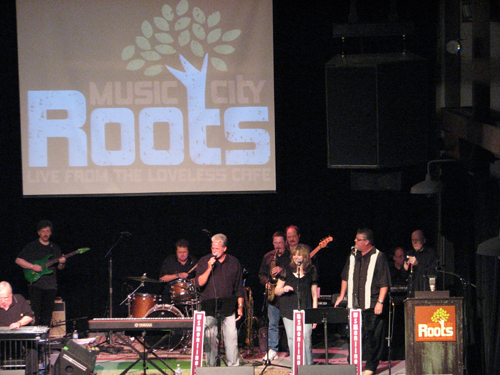 The Music City Roots show has made a tradition of closing out each evening's performance with "The Loveless Jam". This is where all the artists that have performed gather onstage for a "mini" jam-session. It is a real treat for the audience and all the artists look forward to it, too. Here are a few images of the jam. 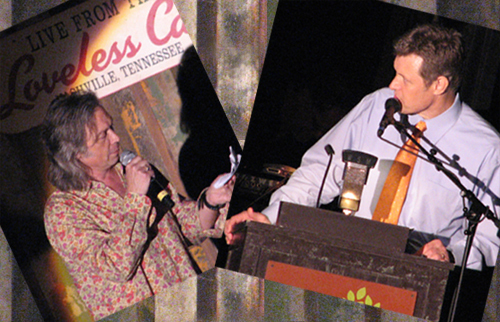 On the bill with Con that night were The New Familiars, Brigette DeMeyer, Nora Jane Struthers, Steve Poltz and Daddy....and of course we can't forget our good friends and hosts for the evening Jim Lauderdale and Bill Cody. 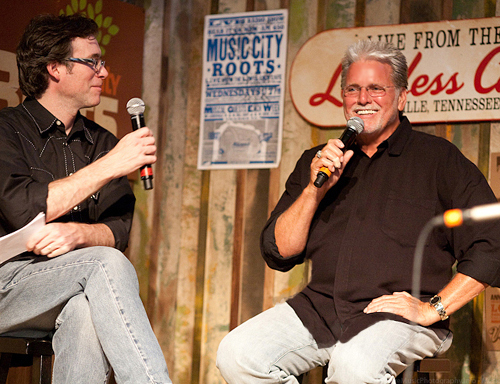 Thanks to everyone at Music City Roots, especially, Laurie, Todd and John. We had a blast! After a great night of music and fun we're all fired up for Fan Fair Hall! Be sure to check out Thursday's pictures!